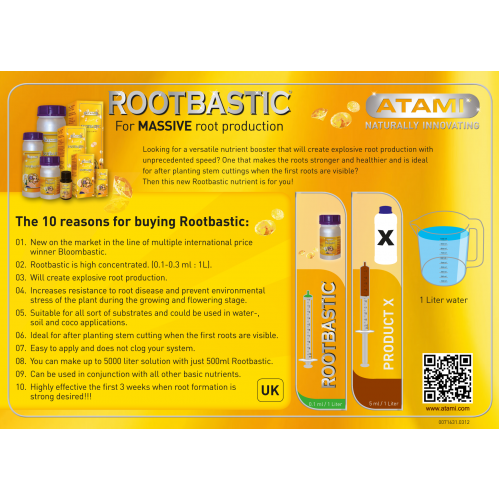 Start using Atami Rootbastic WHEN THE ROOTS are approximately 2 inch long. This will occur during the FIRST WEEKS OF THE ROOTING STAGE when you have done your cuttings. After this, you can still add Rootbastic during the first three weeks of plant growth. Keep your base nutrients low as in the rooting stage adding rootbastic will primarily stimulate your root production. Begin with the minimum Rootbastic dosage and gradually increase to maximum strength. ADD 0.1 ML TO 0.3 ML OF ROOTBASTIC PER 1 Litre of water in your reservoir. COMPLETE NEW PRODUCT IN THE BLOOMBASTIC LINE. COMBINATION OF HIGH NPK BIO STIMULANTS AND BIO MINERALS. INCREASES RESISTANCE TO ENVIRONMENTAL STRESS.